It may not be Scotland’s biggest castle, but Kelburn Castle – 35 miles west of Glasgow – is certainly the country’s brightest. Forget the traditional grey or brown facade you see on most castles. An array of vibrant colours and oversized, abstract characters cover Kelburn, bringing a thoroughly modern veneer to the 13th-century building. 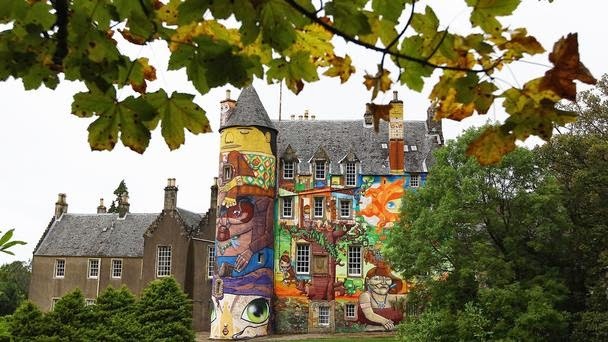 The Graffiti Project started in 2007 when the castle’s owner, the Earl of Glasgow, learned he needed to remove a cement render that had been added to the building in the 1950s. At the urging of his children, the earl, Patrick Boyle, agreed to have the cement painted before it was removed, so he invited a group of four Brazilian street artists to adorn the castle’s turret and walls with their unique style of graffiti art.